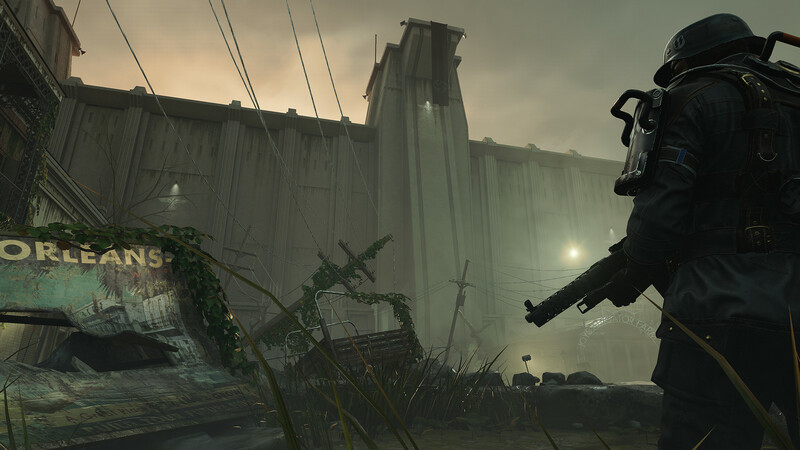 This article contains major spoilers for Wolfenstein 2: The New Colossus (and Jacob’s Ladder). B.J. Blazkowicz is dead or dying, and he couldn’t care less. Rather than a square-jawed powerhouse, Blazkowicz is a broken man who seeks solace in a fantasy world where the good guys win. The scene in question occurs immediately after the game’s hero has miraculously “survived” being executed by his Nazi foes, by having his head grafted onto a new body. Before proceeding with the next blood-splattered mission, you have the option to reunite Blazkowicz with his beloved Anya. As he cradles her in his arms, a nagging thought occurs to him. He recalls that, prior to his rescue, Anya was on the verge of being gunned down in a Nazi ambush. “That was nothing,” she replies sleepily, “We had a few tricks up our sleeve.” Unease grows in B.J. as he recalls those exact words being spoken by Super Spesh, a fallen comrade who was killed trying to rescue him. “Is this real, or am I in heaven?” he asks. But Anya has fallen asleep; he never receives an answer, and the game doesn’t pursue it further. This disturbing little moment is the clearest indication that Blazkowicz is either dead, dying, or has retreated into a desperate delusion. Yet it’s by no means the only evidence to support this theory, which has been the subject of much discussion. Kotaku’s Heather Alexandra has pointed out how absurd (and significant) it is that Blazko’s head fits so neatly onto the “ideal” Aryan form. Many Reddit users have also weighed in on the subject, questioning whether his post-resurrection experiences are genuine. Others have railed against this suggestion, as if offended by the very notion that their subsequent Nazi-slaying rampage was anything less than real. Blazkowicz has, throughout the series, shown a tendency to retreat into pure, comforting fantasy. Prior to his execution, he imagines escaping from his Nazi captors, but instead of freedom he’s greeted by a vision of his dead mother, who assures him that they will be together soon and he has only one more hardship to weather. It’s a beautifully deceptive sequence, illustrating the developers’ willingness to lie to the player and calling Blazkowicz’s view of the world into question. Equally telling are Blazkowicz ‘s mothers words; there are two ways to interpret her message, but that the “final hardship” will be his death is the simplest one. Consider both the improbability of Blazko’s escape, and that everything from that point onwards can be constructed from his prior experiences. One of his fellow resistance fighters had grafted a cat’s head to a monkey’s body and, from there, Blazkowicz has extrapolated his resurrection. Anya, once again, is the first face Blazkowicz sees when he wakes up, as was the case in the previous game, and the bloody errands that he is sent on also rehash his experiences. He’s sent to raid a Nazi colony on another planet and steal an enemy mobile base so that the resistance can commandeer it. These are tasks which are near identical to those in The New Blood. And as a convenient result of his resurrection, he no longer suffers from the effects of the wounds he received at the end of the last game. The New Colossus undergoes a major shift in tone that feels as if you’re stepping back in time to the run-and-gun days of Wolfenstein 3D. The game morphs from a cover shooter into a pure power-fantasy, where all but the most powerful enemies fall before your relentless assault. It makes perfect sense that Blazkowicz, a soldier robbed of his strength, would dream of that level of near invulnerability. 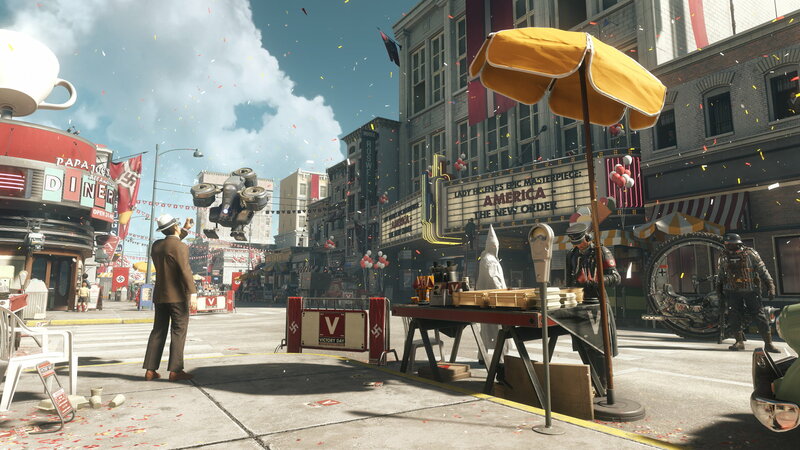 A twist like this would be an odd fit for another first person shooter, but Wolfenstein 2: The New Colossus toys with genre expectations. Despite everything Blazkowicz went through at the end of the last game, the villains, who are traditionally foiled in the last act, still have the world under their thumb. Instead of stepping into the shoes of a battle-ready warrior, you play as a man who can barely stand unassisted. Muddying Blazkowicz’s reality, and hence undermining the impact of your actions, is the logical continuation of this approach. Of course, The New Colossus is not the first bit of media to do this. Stories where the narrator is revealed to be less than trustworthy, or unaware of their world’s true nature, are popular, and the concept of the Dying Dream ending has its own entry on TVTropes, of course. Take the film Jacob’s Ladder, which heavily parallels Blazkowicz’s situation. The titular Jacob is a soldier who has been broken, physically and mentally, by conflict, and it’s only when he willingly accepts his fate that he’s able to move on beyond death. It’s unclear whether Blazkowicz actually dead, like Jacob, or merely delusional, but he’s certainly dead to the world. And as a player, it’s easy to feel short-changed by this situation. Yes, you’ve slaughtered your way to victory and ignited revolution within the hearts of the American people, only you.. haven’t? Instead, you’ve been playing a game within a game and nothing you did really counts. It’s more of a player fantasy that you, alone, can save the world; that out of a resistance force made up of so many individuals, only B.J. Blazkowicz can combat the Nazi menace. Unlike Jacob, Blazkowicz shows no signs of accepting his fate, even though he must be aware of his situation on some level. The actor he replaces, when infiltrating a Nazi base, so closely resembles him that a false moustache is all it takes to complete the disguise. Against all odds he just happens to encounter Adolf Hitler, the man responsible for the world’s misery and object of his own hatred. Blazkowicz never questions this or any of the other coincidences that occur, nor does he push Anya for an answer to his question. But given Blazkowicz’s background, his reluctance to unravel his fantasy is wholly understandable. As is shown in The New Colossus, even before he went to war, Blazkowicz had an appalling home life. His mother did her best to protect him from his abusive father but it makes a grim kind of sense that a child faced with such a monstrous home life would find comfort in his own imaginary world. Throw in the horrors that Blazkowicz faced as a soldier and in the resistance, and it’s not surprising that, as also seen in The New Blood, Blazkowicz is prone to escaping into his own mind. The implications for the world outside Blazkowicz’s head, however, aren’t pleasant. Anya and, in all likelihood, a significant portion of the resistance perished during Blazko’s would-be-rescue. Since he never killed General Engel, the Nazi empire stands strong, and even if the remaining resistance has the will to fight, the world faces a bleak future. Machine Games claim that their upcoming co-op sequel Youngblood (and prequel to Wolfenstein 3) features Blazko’s supposed daughters battling Nazis as they track down their father. But if their father’s crusade was such a resounding success, why, so many years later, does the Nazi empire even stand? Yet Blazko’s choice to part company with the real world isn’t worthy of condemnation. If anything it’s abnormal that, in an age when Post Traumatic Stress Disorder is so widely acknowledged, most game characters are expected to emerge unscathed from their brutal endeavour. It’s expected that, after facing down death and murdering their way through hundreds of soldiers, Sergeant F. Bloodmurder will be ready for another round of slaughter, devoid of any trauma. Ultimately, all the evidence points to the fact that Blazkowicz has chosen to retreat into a fantasy where the resistance rises and he’s always the hero. He’s elected to sweep coincidence under the carpet, to put his fingers in his ears and ignore that tiny voice telling him to wake up. But considering all he’s been through, that doesn’t make him a bad person; it just makes him human. “Is this real, or am I in heaven?” In the case of B.J. Blazkowicz, perhaps ignorance truly is bliss.